Crude prices this morning are $43.85, down $.38 (2.1%) from yesterday’s close of $44.23. Crude opened this morning at $44.35, a full $1 below Friday’s open. 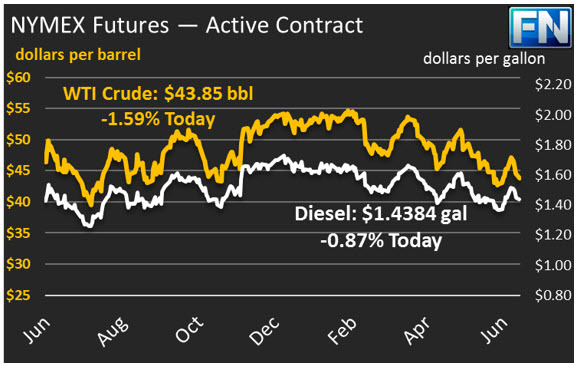 Diesel price are $1.4384, with a loss of $.0098 from yesterday’s close. Prices opened this morning at $1.4512, roughly $.025 below yesterday’s open. Gasoline prices are $1.4809, losing $.0175 since yesterday. Prices opened at $1.5064, just under two cents lower than Friday’s open. Oil prices were strongly down on Friday following the Baker Hughes announcement that rig counts had once again resumed their growth. After 23 weeks of continued rig count additions, last week showed a decline of 1 rig. This week, rig counts rebounded with an addition of 12, to reach 952 rigs in the U.S. So far, U.S. producers are not backing down despite the low-price environment. 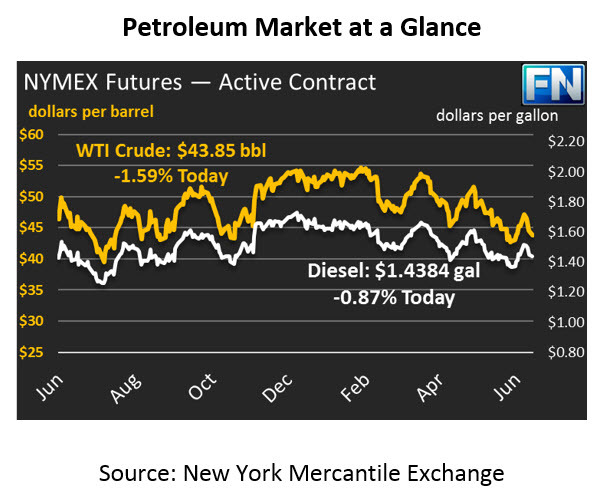 Markets are concerned over a lack of gasoline price action. Gasoline prices normally rise higher in the summer before falling in early autumn in the face of reduced driving demand. With gasoline markets lacking enthusiasm, traders worry that prices could drop even lower going into September.